When our company , ISC International, began to plan an office redesign, we made the reduction of VOCs a priority. At the time, some low- and no-VOC materials were just coming onto the market. But today, with a growing emphasis on indoor air quality and environmentally-friendly business practices, the low- VOC market is going mainstream. Manufacturers are responding to consumer demand, making low-VOC materials more accessible than ever. Flooring: Environmentally-friendly flooring materials and adhesives help to minimize indoor air pollution. Today, formaldehyde-free bamboo, cork and hardwood can all be laid without the use of solvent-based adhesives. In our office redesign, we used porcelain tile and natural fiber, wool-based Karastan carpet which emits little to no VOCs yet is still durable and strong. To see a full listing of eco- friendly options, the Carpet and Rug Institute’s Green Label and Green Label Plus certification program rates low-VOC carpets. David R. Meister is president of ISC International Ltd, a privately-held company that provides global messaging services such as OCR fax services, and text message broadcasting services to businesses around the world including five of the top 10 businesses in the Fortune 500. This is great! 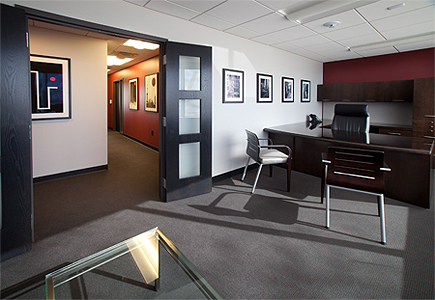 We are so happy you chose GREENGUARD Certified products for your new office–it looks beautiful! Thanks for mentioning us! One thing that’s important to remember when choosing “Low-VOC” or “No-VOC” products: these claims are often based on a product’s OUTDOOR performance, not their INDOOR performance. Products can claim to be “Low-VOC” or “No-VOC” as long as they don’t chemically react with sunlight to product ground-level ozone. Obviously, this is an outdoor air pollution risk factor, not an indoor one. In fact, products that don’t react with sunlight to produce ozone can still emit potentially hazardous chemicals into the indoor environment during application. That’s why it’s so important to look for paints and other products that are proven to be low-emitting (rather than those that simply contain low levels of VOCs). Low-VOC, wow it’s a new concept that I just new this day. I think it’s important to design the interior to avoid that kind of symptom. And now, I need to redesign my home office without minimizing the aesthetic. Intriguing article. I’m sure I’m slightly late in posting my comment but the article ended up being the purpose and just the info I became searching for.